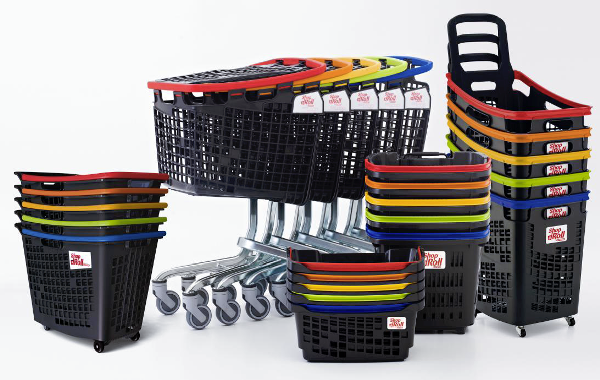 The 80L is the largest rolling basket available. 80 liters / 5000 cu. in. 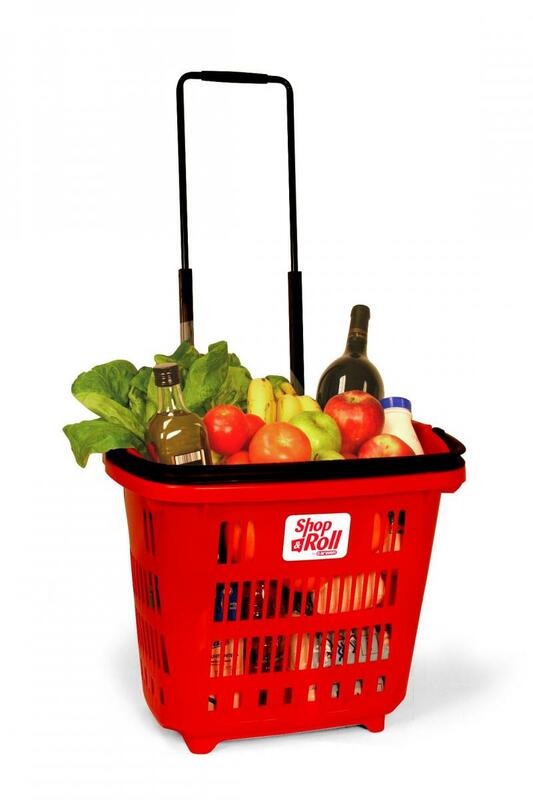 The capacity and convenience of an express shopping cart but at a fraction of the price. And More Practical Function and Capacity. How to Increase Hand Basket Sales by 18% or More! The same design that revolutionized airline luggage has created a new opportunity for merchants to maximize profits and help create the ultimate customer experience. Already popular in Europe, the Shopping Kaddy and Shop & Roll is setting a new standard for customer comfort and revenue generation in North America. 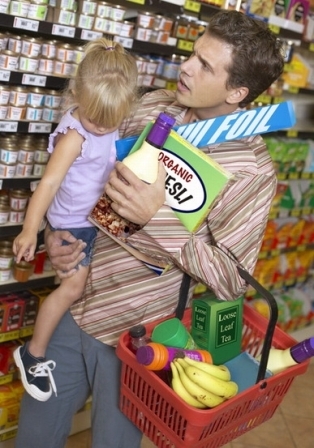 Did you know that nearly 60% of customers stop shopping once a hand basket becomes full or too heavy to carry comfortably. 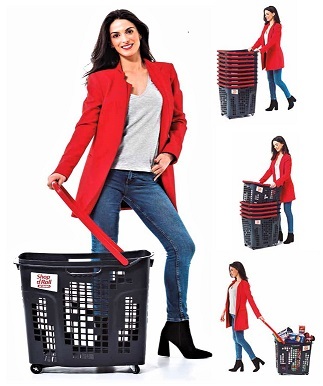 However, customers using the lightweight, rolling Shopping Kaddy with its roomy 8 gallon basket browse longer and purchase on average 23% more than with a hand-held shopping basket, according to a recent A.C. Nielsen study. The Shopping Kaddy’s unique telescoping handle, durable construction and smoothly gliding wheels allow customers to pull up to 55 lbs of purchase effortlessly. Its kid-friendly design encourages children’s participation in family shopping, thereby capitalizing on KIDFLUENCE and creating a more pleasant shopping experience for parents. Equally ideal as a stand-alone shopping method for smaller stores or to complement carts in larger outlets, the Shopping Kaddy boasts 50% more carrying capacity than a shopping basket, yet is too compact to compete with carts. 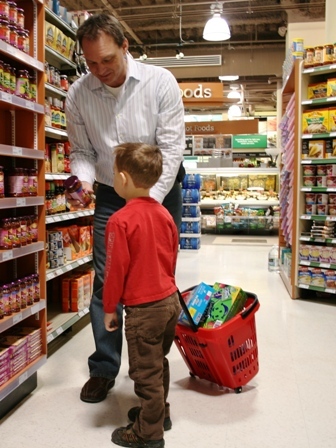 It has, however, proven to promote usage by nearly half the shoppers who would have chosen neither a cart nor a basket, resulting in significantly higher receipts. Shopping does not have to be a chore. Let us work with you to transform your store into a retail experience that shoppers will keep coming back for more.